Another unique but successful Fund-raiser. 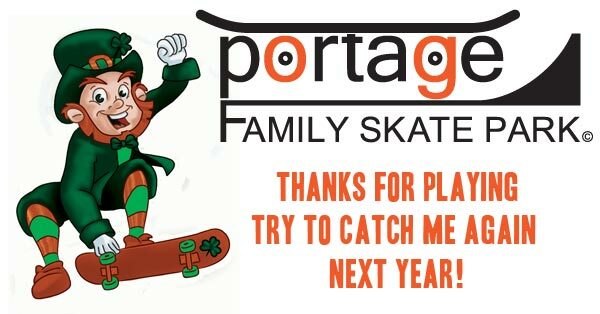 Portage Family Skatepark Project pulls off another unique but successful Fund-raiser with a “Catch the Leprechaun” theme. Several local businesses sold tags with clues to “catch the Leprechaun for prizes. Word spread throughout town pretty quickly. A few tags were sold and by St. Patrick’s Day everybody who cared was waiting to catch the Leprechaun. The day of St. Patrick’s Day started off pretty slow. The Leprechaun arrived at The Percolator for a cinnamon roll and some hot chocolate. I was met by my good friend Debbie who stopped down to discuss the goings on with the Portage Skatepark project. We surmised that it was 8am on a Tuesday so it was not the best of times to catch the Leprechaun, but we enjoyed our visit anyway. Around noon the Leprechaun stopped in to Soul Shine Spa. I had a wonderful time chatting with the Ladies who share the space. They gave me coupons to hand out the rest of the night. This sweetened the pot for anyone else who caught the Leprechaun that evening. Around 5pm The Leprechaun and his friend stopped down to Big Dogs for a happy hour and took advantage of their excellent pool table. For those of you that missed me there for happy hour you missed out on a free pint to start off your night. After a brief dinner in town The Leprechaun and his friend headed to the Hottest spot in Portage on St. Patrick’s Day. At 7pm the Blarney Stone was already the spot to be. The leprechaun was caught for the first time. After that he was being caught once every 10min. The Lucky Leprechaun Hunters each got PFSP Wristbands coupons to Soul Shine Spa and a Pint of Guinness. At 8pm the Leprechaun and his friend headed to Brother’s down the street. We chatted with good people and enjoyed the atmosphere. A few friendly people caught the leprechaun for prizes and drink chips. At 9pm the Leprechaun and his friend headed to Renee’s Bar. We enjoyed the club like ambiance and threw a few games of darts. We had a great time and met some good people till the Leprechaun retired at 10pm. Due to the fact that we only sold tags at a few businesses and tags were only $1 this event wouldn’t have been all that successful if it weren’t for the extra donations collected by the Blarney Stone. This event raised $170 mostly from donations at the Blarney Stone.